A beautifully presented Aston Martin DB5 convertible, complete with an extremely rare factory-fitted hardtop, is being offered for sale by Historics at Brooklands at its second auction on 25th September. Appearing at public auction for the first time, the genuine two-owner car is in original order and is estimated to fetch in the region of £450,000, some 100 times greater than the original recommended retail price of the car at the time of its launch, of £4,562*. Whilst 123 Aston Martin DB5 Convertibles were built, only a handful remain complete with the steel hardtop, and its original condition as per that of the vehicle, represent possibly the last opportunity to acquire a car of this kind. 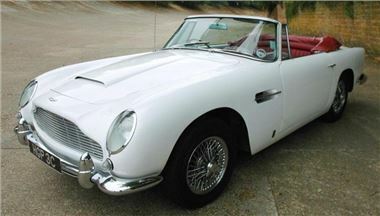 Chassis DB5C/1275/R is presented in brilliant white coachwork with red hide and matching red mohair hood, and having been lovingly driven for just over 100,000 miles, has undergone two engine rebuilds, in 1975 and 1986. The Lot features a comprehensive history file documenting all faithful work undertaken, including a recent service, and contains MoT certificates dating back to 1975.